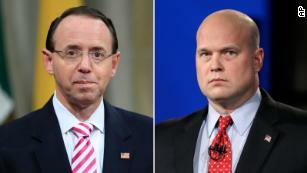 Washington As he was preparing to remove Jeff Sessions as attorney general, President Donald Trump had already begun reviewing with his lawyers the written answers to questions from special counsel Robert Mueller. Despite the change in leadership at the Justice Department, the Trump legal team believes it won’t affect its approach to the Mueller questions, according to one source familiar with the matter. The President and his lawyers have been aiming to return answers to Mueller’s questions later this month, according to one source familiar with the matter. No final decision on an in-person interview has been made. But Trump’s legal team and other lawyers representing witnesses in the investigation expect that the President’s responses to Mueller could be one of the final pieces of the 18-month-long probe before the investigators present a report on their findings. “It’s a disgrace, it should have never been started because there was no crime,” Trump said. Even after Mueller completes his work, Tuesday’s midterm election results mean that House Democrats will also be in a position to expand investigations of Trump. That means Mueller will not be the end of Russia-related questions of Trump and his campaign.